Appear more professional and keep your business cards in pristine condition simultaneously this this two engravable business card case. 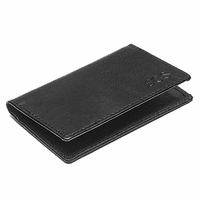 Holding up to fifteen business cards and ideal for men or women, this smart and sophisticated design shines with a smooth satin center bordered at the top and bottom with a mirrored finish. Add free laser engraved personalization to the satin finish center free of charge, perfect for team building gifts and employee recognition awards. 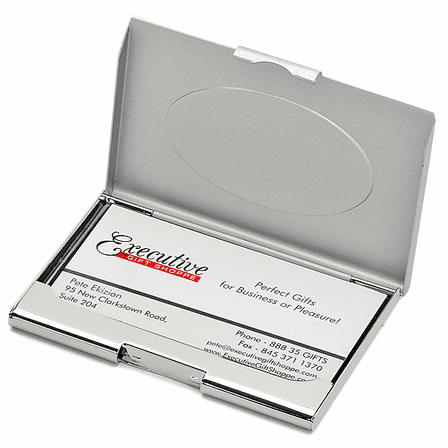 This engravable card case holds up to fifteen business cards and comes packaged in a gift box. Is there a tiered pricing if I order a certain quantity? If so, how many would it take before a price break? Our discount thresholds are $200 and $500 per order and you can find the coupons here: http://www.executivegiftshoppe.com/coupons.html Please let us know if you have any other questions. Thank you! We want our company logo engraved. Do you offer that? Yes, we do. You can email us the logo at help@executivegiftshoppe.com. We would need it in black and white adobe illustrator .eps format, or a 300dpi resolution jpeg. Include in your email the item you are interested in and the quantity. Is this silver plated or stainless steel? Yes, it comes packaged in a gift box. How many business cards does this hold? It holds up to 15 business cards. I want the same font as the front of the one pictured above, i looked at the 3 fonts choices and none look like the one above. Please advise. Thank you. The font shown in the sample picture is the Times New Roman font. Your website advertises free shipping. Why do you end up charging shipping when you check out? We're sorry for any confusion, we do ship all orders over $25 free via USPS First Class Mail. Font size 60 will make the engraving the same size as the sample picture. I would like to see what the engraving will look like before I place the order. How do I know which line to put the individual's name on? Let me know, thank you! We always center the engraving so you can just put it on line 1 if there's only one line or line 1 & 2 if there's two. If you'd like to see a simulation of the engraving before placing the order, email us to request this at help@executivegiftshoppe.com. 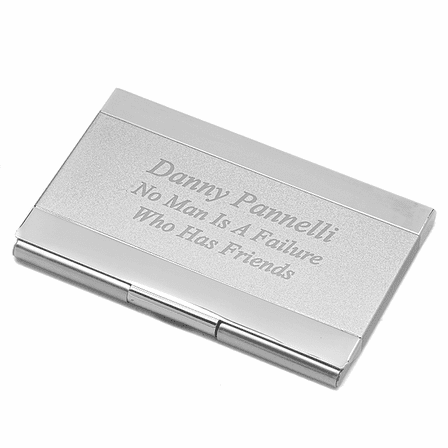 I would like to order 19 business card holders that are engraved with the employee's name. If I order them tomorrow, when would I receive them; Do you offer discounts for multiple items? ; can you please call me at 917-828-2832? I ordered a engraved business card holder and it is stunning. 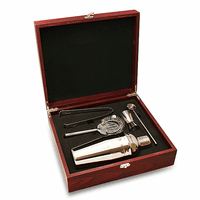 I have never worked with executive gift shoppe before and their communication was excellent. When I originally made the purchase I didn't realize I added the wrong year in the engraving template. I realized about a hour after I placed the order I called left a message and emailed as well. I was reassured that it would be changed and it would be printed the way I had wanted. That was a relief. The engraved business card holder I received is just what I wanted. Nice quality item, at a decent price, extremely happy with my purchase. 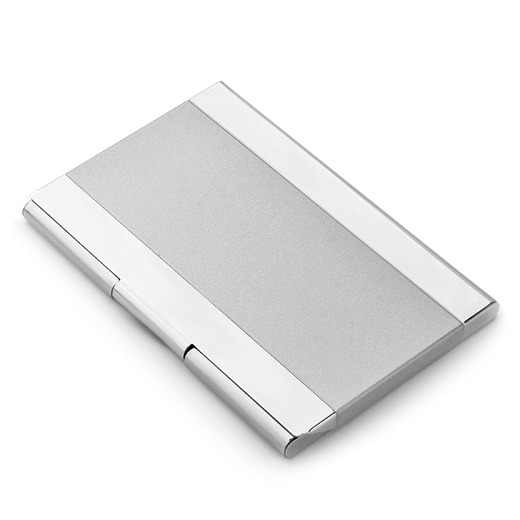 Very nice, good quality business card holder. Engraving is done very well. Website is easy to navigate and create your product. Great deal too! Would make a nice gift. I purchased this card holder as a gift. She loved it. Excellent quality. Will order again. 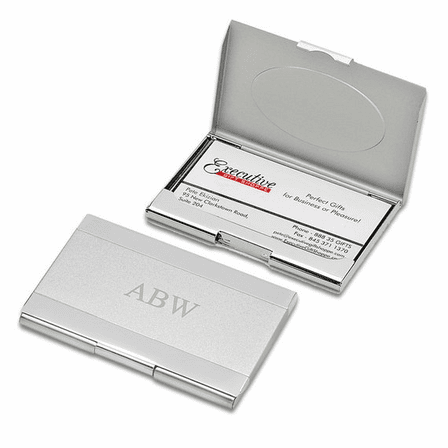 The personalized two-tone business card holder is a great gift, especially with the added touch of engraved initials. This has been a go-to gift year after year. The customer service at Executive Gift Shop is fantastic, too. Questions are answered promptly and thoroughly. Overall, a positive experience from start to finish. The business card holders came quickly and look great. The engraving appears high quality and is very visible. Good graduation gift for our interns. I had four college graduation gifts to buy. The personalized business card holders were perfect. I had their name with a bible verse underneath and put cash inside. They loved their gifts! ConsBe careful of the XS print as it is hard to read. I was very pleased with this item . Beautiful! The card holder was very expensive looking. I gave it as a gift, she loved it. Engraving was excellent. Can't beat the price for personalized card holder! The only negative thing about this card holder is that it shows fingerprints above and below the engraved middle portion. Otherwise, I would have given it 5 stars. The engraving was beautiful. It was engraved and shipped immediately. It's absolutely beautiful! When it arrived, the catch was a bit hard to open, but a small adjustment with a pair of pliers soon fixed it. No big deal, but if not for that, I would have given five stars. We absolutely loved our engraving and customer satisfaction was over the top!!! ConsEasy to have fingerprints on. Hard to open. Cracked my nail when i tried to open it. Engraving came out even better than expected and the holder is very well made. Great deal for the price. The engraving was not as it was pictured. It is confusing when you enter the letters you think you are getting them in the format that is pictured. I was disappointed that they were vertical and not horizontal. Merchant Response:We're so sorry for the confusion, it looks like you entered the letters vertically, one on each line, so that was how we engraved them. We'd be happy to send you a new one free of charge with the letters on one row. Can you email us at help@executivegiftshoppe.com with your order #, last name or email that you used to place the order so we can send a replacement? Engraving was nice but there was a tiny mark on the case below the engraving, and when I tried to rub it off, it just got bigger. Also, it is a little difficult to open. Merchant Response:We're so sorry about the scratch and the difficulty you're having opening this case. We'd be happy to ship you a new one free of charge, the same or a different style if you'd like. Just email us at help@executivegiftshoppe.com to let us know which one you'd like to go with as a replacement. I was very pleased to get this item about 3 days after ordering. ProsIt looked very nice, the monogramming was correct. ConsThe latch for opening and closing was not easily done. I hope it doesn't get broken by my grandson, for whom this was a gift. Finally got a personalized and cool card holder. No complaints! Quality product, great engraving, great customer service, great shipping time. Very pleased. ConsAs with all shiny metal objects, it shows smudges/fingerprints easily. Case is a little hard to open the first few times but loosens up after some use. Good product and great customer service. I was amazed at the turnaround and delivery of the business card case. The case was engraved on the day the order was placed and it went out for delivery the next day. It arrived prior to expected delivery date. 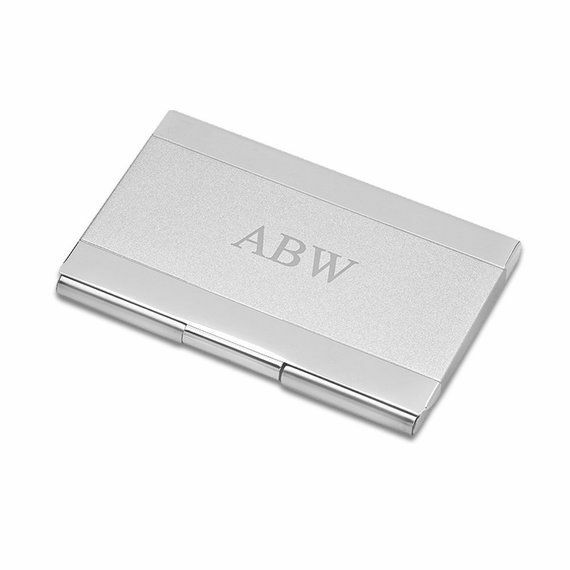 ProsThe quality of the business card case was very good and the engraving gave it a professional appearance. The recipient and I were very pleased with it. Need to advertise this site more. Awesome site. ConsNot very easy to navigate site until you're used to it. I got this as a last-minute holiday gift for my boyfriend. The item is true to its description and the monogram came out well. It's a little smaller (in terms of how many cards it can hold) than I would have liked. 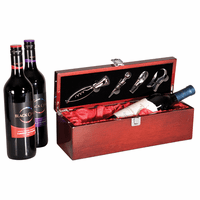 This is a beautiful and elegant product I am very happy to give as a gift. 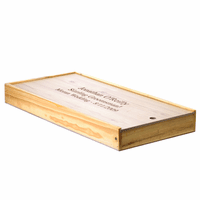 The product arrived quickly even though it is engraved and is reasonably priced. Thank you.